Submitted by Daniel Fehn on 11/05/2014 - 21:05. 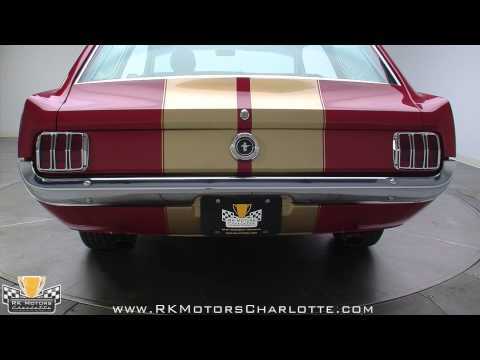 I stumbled upon RK Motors Charlotte (My favorite classic car dealership) selling a 1965 Ford Mustang Station Wagon a few months back, and it really peaked my curiosity. I knew from the top of my head that Ford has never officially built a Mustang station wagon, but I wanted to know more about the historical aspect of this unique car. But first let's talk about this model I found for sale, which was built off a Mustang wagon model actually built in 1965, and ties to the early history of the Mustang. This Mustang wagon was built by Joe Kamp, who based it off a wagon that was featured on the cover of the October 1966 Car & Driver magazine. The featured mustang in this magazine was built by Intermeccanica in Italy, with the idea being born from Barney Clark (an advertising executive tied to Ford), and Robert Cumberford (a car designer who had a relationship with Frank Reisner at Intermeccanica). They had planned on presenting it to Ford as a possible model idea, but we will talk about that failure a little bit later. Joe Kemp built this wagon to drive. He used 100% steel for the entire body (the hood is fiberglass) to be period matching if it was built in 1965, but teamed it with a newer 5.0L V8 engine and a 5 speed manual Hurst shifter. The chassis was reinforced and strengthened to handle the extra power. The wagon drives and handles like a newly built Mustang, as the entire Ford EEC-IV engine management system, including mass-air induction system, was able to be squeezed into the engine bay, rather than use an old school carburetor. All the chrome from the 1965 Mustang was kept to really make it look like an original Mustang. 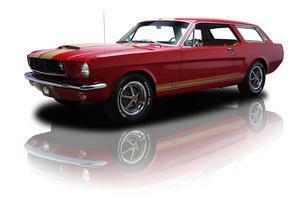 History of the Ford Mustang Station Wagon. As I stated earlier, Ford never produced a factory Mustang wagon. The closest they came is by building two fiberglass prototypes. So how did an actual model get on the cover of Car & Driver in 1966? Clark and Cumberford (along with the rest of the world) had fallen in love with the newly released Mustang, and they had Intermeccanica build a station wagon version they planned to present to Ford to be built. Dennis Adler wrote in an article published in the October 1991 issue of Car Collector magazine that according to Cumberford, “Ford styling chief Eugene Bordinat was incensed over the idea of an outside proposal, and Ford ultimately rejected all three designs, putting the lid on the Mustang wagon.” Cumberford then tried to get Holman and Moody to build the wagon, but they turned him down as well. The Intermeccanica version (supposedly they built two models), was photographed in the New York/Long Island area within a year of the magazine article, and it was very dirty as if it had been used as a family vehicle. You can see the images below. The car basically disappeared after this with some claims that it was eventually crushed, and others that say it is currently in storage somewhere in the area, likely rusting out. Through the creative minds and hands of Mustang fans, I have been able to document nearly a dozen different wagon models around America, mostly by pictures only below. By doing some research online, I have basically found images only and I don’t have contact info to research these further. I would really like to find the owners and builders of these modifications, if anyone knows any contact info please send me a message so I can interview these builders. Below are some more photos of Joe Kemp's model, with more historical photos below.